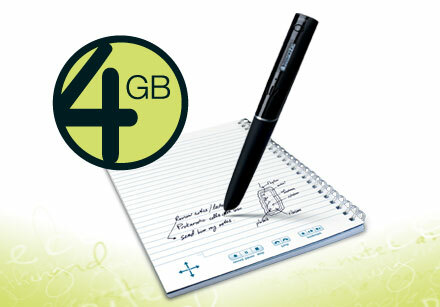 4GB PULSE SMARTPEN ECHO - Records 400 (4GB) to 800 (8GB) hours of audio and thousands of pages of notes. Replay the recorded audio by tapping directly on notes. Save notes to the computer and search for words within the notes. Share notes and recordings as a pencast, PDF, or audio file. Customize your Smartpen with downloadable apps including dictionaries, translators, productivity tools, games, and more. Includes: Software for Mac or Windows, starter dot paper notebook, micro USB cable, 2 ink cartridges, and 2 Smartpen caps.